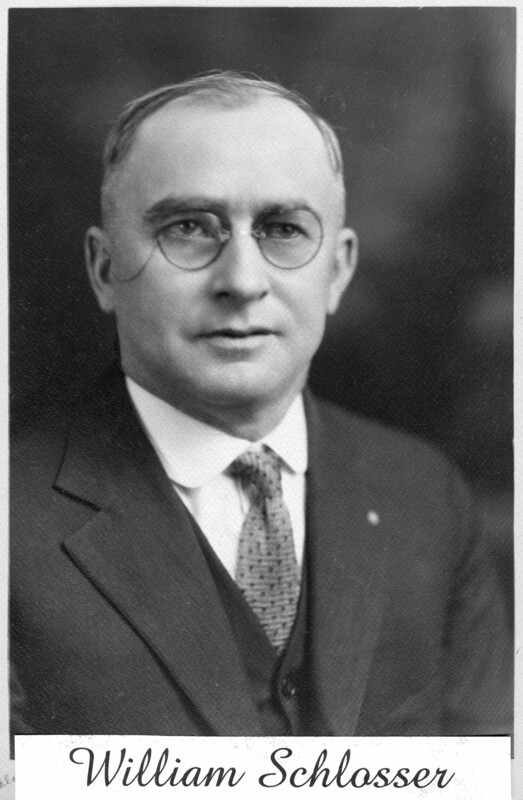 Dr. Walter K Schlosser (1888-1973 – obituary) grew up on a farm in German township, studied medicine at Indiana University, and spent most of his career as a part-time surgeon and a full-time chemist and manager at the Schlosser Brothers Creamery in Plymouth. In 1942, he helped found the Doctor’s Hospital in Pittsburgh, Pennsylvania, and served as its chief surgeon. Click any image to display a larger version. He lived to be 85 and died in 1973. In his later years, he wrote his personal remembrances, which were gathered into a short book and also published as a series of columns in the Bremen Enquirer in 1971. 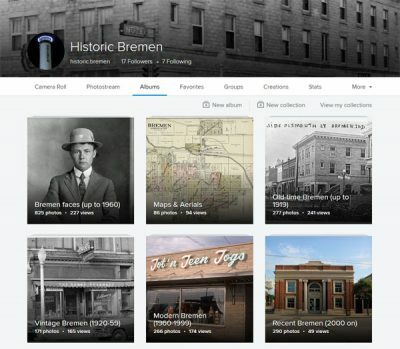 Historic Bremen is pleased to present them here with compliments to the family. There were, of course, other great happenings like Columbus discovering America and glaciers that came down from the North Pole. In fact, our homestead (The Farm) was founded on a piece of land which was once covered by a glacier. I thought it would be fitting to give you a few little happenings that transpired in the early years of the 82 years I have lived. My two maternal grandparents, Daniel and Catharine Martin [he: (1830-1900) she: (1836-1908)], had eight children: Janet, Harriet, Emma, Norman Eddy, Lot, Julia, Caroline, and Monroe. Daniel Martin was a son of John Martin, who lived in Martinsburg, Pennsylvania, and Mary [Friend] Martin. John Martin took his family in a covered wagon and traveled across the country to southern Indiana. I can remember my mother telling me that once in a while people traveling in covered wagons would be robbed and murdered and the scoundrels did this to get the horses. My Grandfather Martin as a young man migrated from southern Indiana to Benton Harbor, Michigan, where there was an iron ore mine. He worked in this iron ore mine for a while and then migrated to Bremen, Indiana, where he took a job with the postal authority to carry mail by horseback from Bremen to South Bend, Indiana. While in Bremen, he fell in love with a pretty girl by the name of Catharine Parker. After a short courtship they were married and started out together as farmers. Both of them were of the Brethren Faith. I can remember that my grandfather wore a big, black, wide-brimmed hat. He wore no buttons, and all closures were made of hooks and eyes. Grandmother wore a white bonnet. 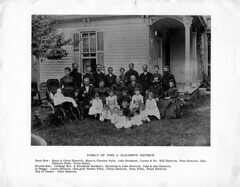 On my paternal aide, my grandfather, Jacob Schlosser [(1829-1906)], was the son of Jacob and Dorothea [Ritchie] Schlosser, and came to the U.S.A. with his brother, Philip, in 1848 from Rhinebein, Germany [Rhinebaiern, AKA Circle of the Rhine], at the edge of the Black Forest (between Kaiserlautern and Permens [probably Pirmasens]). Jacob was 18 and Philip 13 when they came over on a sailboat. He was married to Eva Margaret Karrer [(1829-1892)] on April 26, 1857 in New York City. Eva was born in Zuzanhausen, Baden, Germany, and was the daughter of George and Elizabeth [Oblander] Karrer. 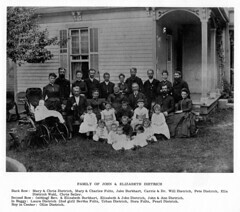 They also had a large family: Frederick, Philip, George, Henry, Jacob, Elizabeth, Gustave, William, and Samuel. My father and mother had six children: Eva, Vern, Monroe, myself, and Dolly. One child, unnamed, died a few days after birth. 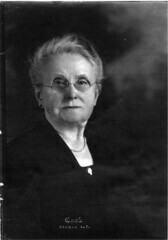 Our parents were Emma and George Schlosser [she: (1859-1940) he: (1861-1935)]. On April 26, 1888, I was born on my parents’ farm which was three miles southeast of Bremen, Indiana. My mother’s aunt was the midwife. Doctors at that time did not attend many mothers at babies’ births. Mother told me that I was rather a weakling and that I had a difficult time surviving. In fact, when I was eight months old, mother’s sisters came to visit and one of them said, Emma, you should name the baby before he dies.” In those days they did not name babies right away as they do now in modern times, so they figured out a name. 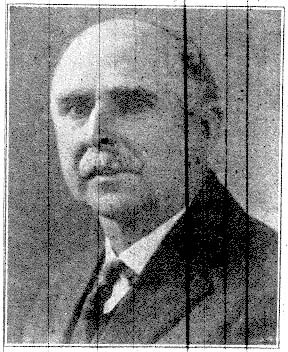 Aunt Caroline suggested Walter because she said her husband had an uncle, Walter Huff [probably Walter M Huff (1868-1948)], who was “such a nice man.” Mother suggested the middle name of Karrer, which was my father’s mother’s maiden name. I grew up somehow and it was the style in those days for a boy to wear knicker pants which came to the knees, black stockings, and buttoned shoes until he was about 12 years old. I anxiously awaited the day when I could wear long pants. When school started in the fall (7-month sessions), I walked three-quarters of a mile in the country on a dirt road to a one-room schoolhouse which was then called No. 8 school in German Township. I can remember in my first years of school, we wore leather boots with brass guards on the toes which gave the boys a chance to kick the stones as they walked along. Also during the first years of school, we learned our A B C’s and the multiplication tables up to 12 times 12. We had good teachers and I am very much indebted to all of them. They did their best to help us get started. 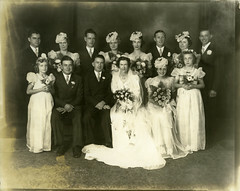 After the marriage of my parents, they lived for one year on a farm that was owned by my Grandfather Martin. One day when I was about nine years old and on my way to school, I saw my grandfather’s buggy at the Yockey Farm. He drove to this farm during the night from Plymouth. He would always travel at night so he would not lose any time on his farm in the daytime. I idolized my grandfather so I went to the little old house where he was resting and, of course, he welcomed me in. I stayed there all day hearing him tell great stories about the past and telling me that every day I went to school was worth a dollar. (I wonder how many dollars that day made me lose.) For lunch, we cut potatoes in small slices and fried them on the iron stove lids. This made a very satisfactory meal. When he saw the other children coming home from school, he told me that I had better get out of there and follow them. They beat me home by a quarter of a mile. Evidently one of my older brothers or sister told my mother that I didn’t go to school that day and that I was up with Grandfather Martin. Presently, I saw my mother coming down the road and I was expecting the worst, but when I told her I had had such a great time with grandfather, she didn’t say a word and we went back home together. Grandfather Schlosser was the opposite in temperament of my Grandfather Martin. We could have fun with Grandfather Martin, but not Grandfather Schlosser because he was all business and very serious. For instance, every morning we three boys would deliver fresh milk from our farm to the creamery in Bremen, and it was necessary to go past Grandfather Schlosser’s farm with our horse-drawn buckboard loaded with about three 10-gallon cans of milk. He knew about when to expect us and, of course, we were watching for him. Soon he would come hobbling out to the road and at the proper moment would raise his cane to halt our horse. His one and only question every day was, “What is Shoats (George) doing?” The two boys who were not driving would decide in advance who should answer him. As soon as this answer was given, the driver, who was usually Vern, would slap the horse with the reins so we could hasten on our way. 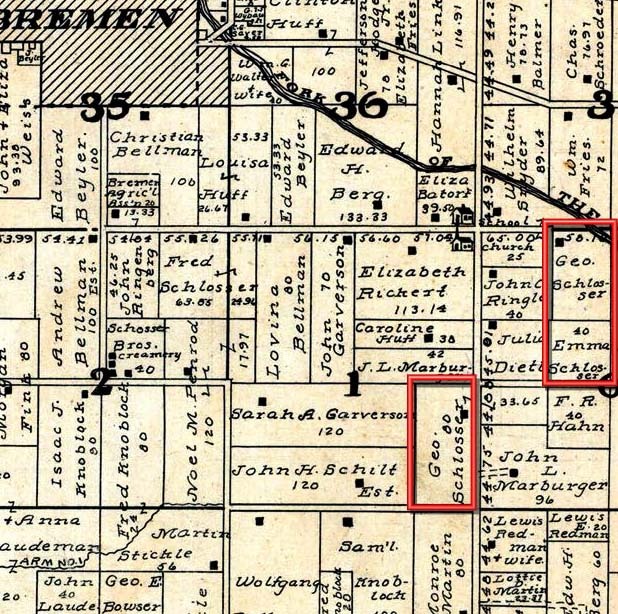 After my parents had lived on Grandfather Martin’s farm for a year, they purchased 40 acres of land (which Aunt Verna now lives on) from two maiden women for $2,800.00. I am told it was not mortgaged. They just signed a note and gave their word and a handshake that they would pay the money, which they did. All father and mother had when they got married was a blind horse which Grandfather Schlosser had given them, and a cow called, Kate, that Grandfather Martin had given Mother. I don’t know what happened to the blind horse, but I do know that a descendant of Kate always stood in the first stall of the cow barn for over 50 years. We usually had about 8 milk cows. While the children did other chores, Mother and Father milked the cows, morning and night. While sitting there milking was their time to talk over affairs of the day, concerning the family, farm work, or community interests. They even made most of their own furniture with the aid of Uncle Philip [(1859-1901)], who was a carpenter by trade. It was Philip who made the old dry sink we now have in our bedroom. For over fifty years, it was part of Mother’s kitchen equipment and was used much as we use counters and lower cabinet space today. It always used to be painted, but we had it refinished walnut and it is a good-looking piece of furniture with much storage space. Some day it will go back to the old home where Aunt Verna will prize it, I am sure. This farm they bought had a house with five small rooms and a woodshed which was attached to the kitchen. One part of the Woodshed was used in the summer as a place to cook and eat. The other part was used for storing the wood and supplies to keep the stoves burning. There is an old legend about these wood-sheds and a big cherry switch which was kept for unruly children. I can never remember my parents using the shed for that purpose. I had a very good father and mother. Mother used to get up at break of dawn and she would work out-of-doors in her bare feet and watch the early birds and hear their morning songs and the chickens cackling. Then Dad would get up about 6:00 in the morning. They were good hard workers and they talked to their children about the necessities of working. To them I give my heartfelt thanks for allowing me to be raised on a farm. When I was about 6 years old, my parents decided a larger barn was needed. Dad cut timber from our woods in the winter and by summer it was ready for use in the new barn. He razed the old barn and got ready for the erection of the new one. That meant the whole neighborhood—men, women and children—came for the barn raising. One side of the barn was made for the milking of cows and the other side was used as stables for the horses. Back of the barn was a place to feed steers. A silo was erected at the northwest corner of the barn. This was one of the first three silos in the county. My father, Uncle Henry, and Uncle William ordered these first three silos which were shipped to us by freight unassembled. My father, brothers and I, drove to Bremen to get our silo parts which consisted of cedar staves, 6 inches by 30 feet and 1-1/2 inches thick, iron bands 16 feet in diameter, and doors. As we drove through Bremen, our wagon piled high with these parts caused quite a bit of curiosity and comment. It was my job after school to come home and help feed the animals—hay for the horses, and silage for the cows. I also had to provide them with fresh bedding from the wheat stack. This would take about an hour and a half. Every Saturday we three boys had to clean out the manure from the barn. When Father and Mother decided to build a new house, my father just wanted to go by a carpenter sketch, but Mother held out for an architect, and so an architect from Nappanee was secured. They built an 8-room house and my recollection is that its cost in actual dollars was about $2,000.00, besides my father furnishing all the lumber and stone. He also bought some finishing lumber for the doors and windows. This home is now occupied by our daughter, Verna, her husband, Robert [Neidigh], and their four children. The house was built in 1900. Everybody worked at our home to keep the wolf from the door. My Uncle Henry had a small creamery in Bremen and when I was 15, my father secured a cream route for me during the summer months. With the money that Uncle Henry paid for my services, father hired a full-fledged hired man who could do more work on the farm than I could. I had two routes which I drove with a team of horses drawing a yellow cream wagon. Three times each week, I drove from farmhouse to farmhouse picking up the cream and taking it to the wagon and weighing the pail on a spring scale. Practically every housewife would help me carry the cream out to the wagon saying that I was too small to carry a 60-pound pail of cream. I remember distinctly how they would watch me weigh the cream exactly and record the weight on the tally sheet. 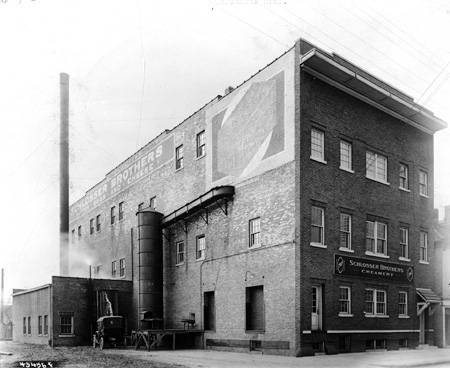 After stirring the cream and taking a sample to test for butterfat, the cream was poured into thirty-gallon cans which were tin-lined and insulated to keep the cream cool. The covers were also insulated. Also, as a rule, each patron wanted to sell a dozen or so eggs to get a little extra money. I paid cash for these and carried the money in a large canvas poke about 8 inches long and 4 inches in diameter. The cream driver in those days was the bridge of communication between neighbors. He was also the one who carried gossip from neighbor to neighbor as they would tell him what to say to Aunt Mary, Aunt Lilly, and so forth. In other words, I became an expert on news such as births, deaths, funerals, and the transferring of all kinds of communication affairs such as young peoples’ dates, parties and weddings. The creamery paid the farmers every two weeks. This check was a life saver. It was used by the housewife to buy groceries, calico, tablecloths and so forth. One of my cream routes was a short one which gave me time to stop at the baseball diamond on the fairgrounds and play scrub baseball with any boys who happened to be there at the time. 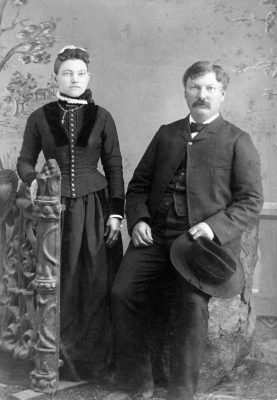 I remember one couple by the name of William and Tiny Motz [he: (1861-1935) she: (1859-1937)], who lived on a 40-acre farm about 3 miles south of our home. Tiny was one of the neatest and cleanest persons I am sure I ever came in contact with. I believe you could actually eat your meals on her porch steps. She was a little 90-pound, 4 foot 8 inch woman, who was kind, gentle, and Christian. Her husband, William Motz, a short, fat man, besides being a farmer, was also Sexton of the little church that was nearby [probably United Brethren]. On Sundays, Mr. Motz would ring the bell to notify the community that church would be ready to start in an hour. It would give the people time to hustle along with their work. Then he would ring the bell again when church was about to start. I recall one time during the week when Mr. Motz tolled the bells 85 times signifying that “Grandfather Senif” [probably Jacob Senff (1817-1902)], one of the deacons of the church, passed away. J. P. Huff [John Huff (1843-1915)], the Bremen undertaker, was notified of the death and he went to the home to prepare the body to be laid out in the front room for viewing. As usual, a neighbor woman helped with this task. Three days later he conducted the funeral procession. 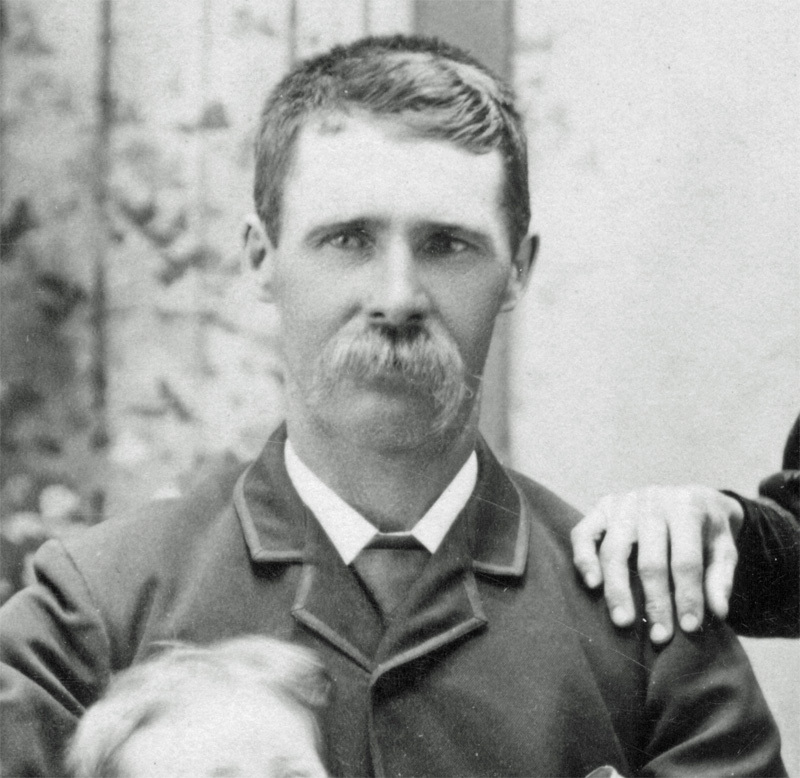 Mr. Huff, his son (Clayton), and grandson (Otho), in succession, had been in the undertaking business for many years. In the procession was first the minister in one vehicle, then the pall-bearers, the honorary pallbearer, and next in line was the black hearse drawn by two black horses, then the relatives, friends and neighbors. On a high seat at the front of the hearse sat Mr. Huff and his driver, both dressed in black. Mr. Huff was spectacular in a high top hat and long, flowing beard. This was probably one of the largest funeral processions I have ever seen. It was a memorable sight. They lived about seven miles out, and in those days the horses never trotted—they walked—so it took over two hours to get this funeral to the cemetery in contrast with today as they speed up the funeral with the automobile. I can recall old Mr. Senif in church services in this little church. The women would sit on the left side of the aisle and the men on the right side. On the left side of the pulpit were the choir and the organ. On the minister’s left were the honorary deacons. Everyone would say “Amen” to the sermon every few minutes. As the minister got a little louder the Amens would get a little louder. The last pew of the men’s section was taken up by some foolish boys. (I may have been one of them.) Every so often the minister would stop his sermon and give the boys a little tongue-lashing. I remember distinctly a couple about 60 years of age by the name of Faulkner [probably Elijah and Annie [Shoaff] Faulkner of Bourbon]. In winter they were dressed in warm clothes and each one wore a large scarf about four feet long. These scarves were wound around their necks and they would take them off after they got in church. 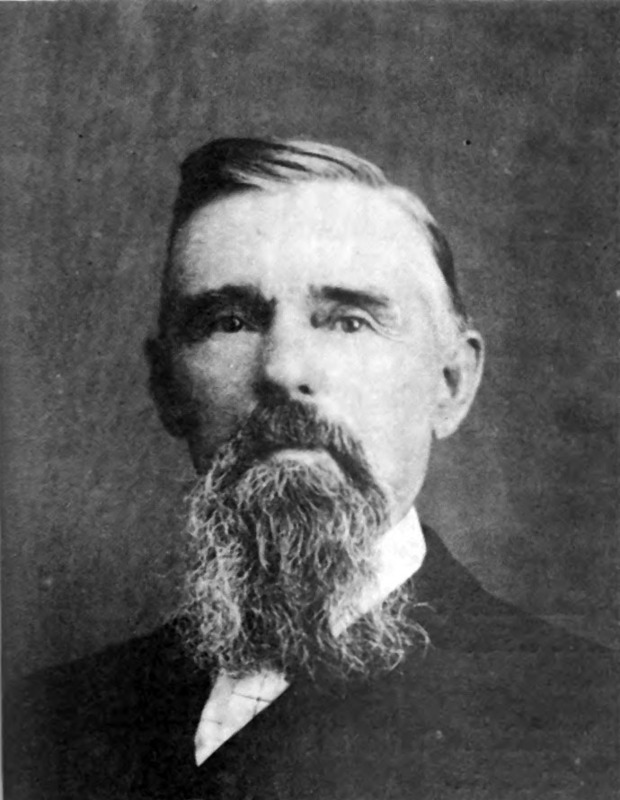 Reverend Faulkner was a lay minister and would take his place in the pulpit in case something should happen to the regular minister. When the time for prayers came he would be asked to pray and he would offer a beautiful prayer. Next, his wife, who was tongue-tied, offered a prayer. She would start with a low voice but before she got through, her voice was very high and shrill. In other words, when she got through praying she would have the devils and sinners in the fiery furnace of Hell and all the saints standing on the right hand of God the Father Almighty. My brothers, Vern and Monroe, and I spent a number of evenings looking through Montgomery-Ward’s catalog for a gun. Finally, someway, somehow, we got together $14.00 and ordered a double-barreled shotgun. When it arrived, we three boys were tickled pink. However, we found out that brother Vern would end up doing the shooting. Every time we started out to hunt, an agreement was made that Vern would shoot first at the rabbit, the next shot would be Monroe’s, and the third would be mine. However, when we saw a rabbit, brother Vern would say, “Give me the gun, give me the gun.” So, of course, he did most of the shooting. Sometimes Monroe would shoot, but I would end up carrying the game. However, one day we were at the old “60” along the banks of the Yellow River. We came across a dead willow tree and up on this tree trunk was a woodpecker pecking away making a shattering noise as he hunted for worms. So brother Vern shot at the woodpecker. I thought I would have a nice trophy to carry home, but that woodpecker just kept on pecking at the hole. We stood there stunned for a few minutes and then walked down to the swimming hole on the left bank and took a nice swim. We went home empty-handed that day. In those days we did not have a man-made swimming pool. This swimming hole was just a gorge in the river. Another peculiar thing about this swimming hole was that when we would go to the old “60” to cultivate corn or do other work, it seems our horses would get extra tired at the end of the row and so to rest them, we would go down and take a plunge in the swimming hole. One Memorial Day when I was about 12 years old, the family went to the memorial exercises at the cemetery and then they drove home, and I was left to walk home after watching the Bremen White Sox play baseball. Somehow, I had a nickel and I bought two cigars with this nickel. As I walked home, which was about 3 miles, I thought I was a big boy and I would smoke one of the cigars. When I got half-way home, I lay down at the trunks of two big elm trees and I guess I was never sicker in my life than at that moment. As I lay under the trees, I felt like Job in one of the Bible stories. I threw the other cigar away and managed to get home and get upstairs to bed. In the morning, I tried to act normal and set out to do the chores. 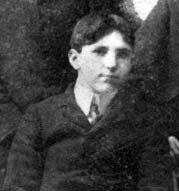 Brother Monroe always mingled with older groups of boys. They had a group called the Spartans above the corner hardware store. They would play a nice game of cards and smoke good cigars. One evening one of my friends gave me a cigarette to smoke, but as luck would have it, brother Monroe saw me smoke. That night he asked me to stop smoking and I promised him I would. I have never taken up the habit since. I used to like to play baseball on holidays and Sundays. The ball team would give each player $2.00 to buy his lunch and play baseball. 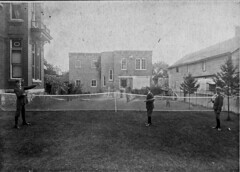 Of course, to play baseball I had to hire a man to take my place on the farm, so I used the $2.00 to pay Lou Redman [Lewis F Redman (1855-1920)], our neighbor, to take my place on the 4th of July that our team went to South Bend to pay the South Bend Spiros. I must have carried my lunch. You might be interested in another 4th of July when the Bremen White Sox played baseball against Syracuse. Six of us boys wanted to see the game, but it was too far to drive, so we took a B&O passenger train for Syracuse, Indiana. Naturally, we thought another train would be bringing us home. When we returned to the depot, we found out that the only train was a freight train, so we climbed into an empty coal car thinking the train would stop in Bremen. When the train got to Bremen, it put on steam and didn’t slow down until it was about three miles out of Bremen. We boys jumped off as the train was going slowly up a grade and had to walk three, miles back to Bremen. When we got back to Bremen, I drove home with the horse and buggy which I had left at the O. F. S. Miller [druggist and postmaster Otho F S Miller (1844-1900)] barn that morning. I don’t know what my parents would have done, if they had realized that we had come home in a freight train, but I was up the next morning, harnessed up two of the horses and got ready to go thrashing [sic]. That 4th of July Uncle Monroe Martin took my place on the farm. While still in grade school our balls were made out of yarn which our mothers gave us and this yarn was wrapped around a rubber ball. For several years we had what was called the No. 8 School Team and we would make a playing field by going to a pasture field and using stones for bases. Then in later years I played center field with the Bremen City Team. This leads me up to tell you about baseball at college. When the call was made by the coach for the freshman baseball team, there were about 50 boys that went out. Early in the spring we practiced in the gymnasium and in March we practiced on the freshman diamond. 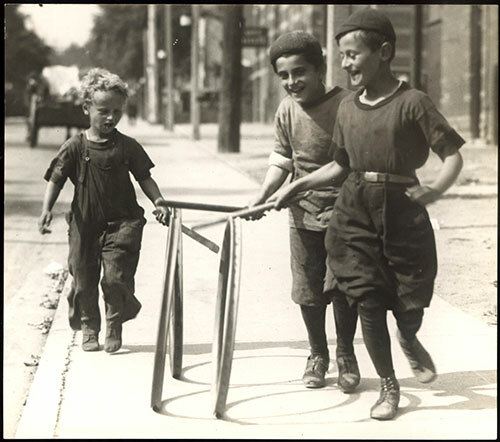 There was a large gap between the urban students of the larger cities, such as Indianapolis, Evansville, and Kokomo, and the rural farm boys in matters such as dress and our social lives. The urban students were fancy players and runners and they would try to show off. It looked like the rural boys would not make the team, so the rural boys had a meeting which we called the Council of War. We knew none of us would make the team unless we did something drastic. We decided to outwork the urbanites. It was decided we would never walk on the diamond nor the field—we would always run. I remember one time in practice when a ball was hit to left field and it was headed for what is called Jordan Run, a small creek that had three to six inches of water in it, and I was playing left field. I knew that none of the urban boys would get their feet wet, so I decided to catch the ball in the creek—something that was never done before. From that time on, the coach would speak to me and smile. Before that time the country boys did not have much of a chance. The net result of out-working our opponents was that the freshman team was made up mostly of our farm boys. Black American crows are sometimes a nuisance. They often follow the farmers planting corn and sometimes they scratch up the corn and eat it. To combat this, the farmers would take an old suit, stuff it with straw and attach a pole to the suit, putting a straw hat on it, and then placing the pole in the ground. This was called a scarecrow. Also on the pole would be attached some pieces of tin with the idea that the wind would play tunes on the tin. This noise and the stuffed man would scare the crows. One day we boys, with Vern carrying the gun, went to the field just west of Mother’s eight acres of woods. We were not allowed to enter the woods because Mother never allowed within that sanctuary a woodsman with an axe with a view of cutting down a tree, or a huntsman with his gun to kill a bird or animal. One time I saw a crane with legs two feet long and a long neck and bill. It was feasting in the small pond on worms, leaves and grass. Birds and animals had a sense of belonging at this place. It was free to them because it was not subject to man. In the field west of Mother’s woods we saw a crow flying and Vern took a shot at it. He must have hit the crow because in a few minutes the whole sky was filled with crows all coming from the north over the Yellow River. They circled over us for quite a while and gave us a talking-to and also made an awful noise. We boys stood there motionless and finally the crows left, flying south. They were gone only a few minutes when here came three turkey buzzards with a view of picking up anything dead that was left by the crows. We thought a crow made a lot of noise, but these three turkey buzzards made more noise, much more shrill, and we did not know if they would come down on our heads or not. Again we stood motionless, as quiet as mice, and in a few minutes they finally decided there was no food for them, so they moved south. After the turkey buzzards left us, we went down to the old swimming hole. The turkey buzzard was a bird with about a four-foot wing span and they lived mostly on dead animals, such as mice, rats, sheep, lambs, and so forth. They usually followed the crows after about 15 minutes. Mother often walked alone to the above-mentioned woods, usually in the morning, to pick wild flowers, listen to the birds sing, watch rabbits hop around, and squirrels swing from tree to tree, and generally enjoy this tranquil spot. As a tribute to our Mother, we children left a small deposit at Purdue University in her name, with instructions that the interest would be used for conservation of small birds and animal life. This was given in the name of Emma Martin Schlosser. Father always had about eleven to thirteen horses. Therefore, he could have at least three teams ready to work in the fields at any time. Horses are the same as people, some are easy-going, and some are very, very mischievous. I remember one horse called Flora. She was a good workhorse and a fairly good buggy horse, but you had to watch out or she would give you a little kick when you walked behind her, and when you fed her from the aisle, she would even try to bite you. In other words, she wanted to bite the hand that fed her! Dad got Joe in Nappanee from Dr. Inks [Charles A Inks (1876-1942) or his father John S Inks (1848-1921)]. He always had black horses and got a new one every year. Joe was long-legged, a good jogger, and an excellent buggy horse. We had him about three years. I thought of him as my horse because I always drove him hitched to a rubber-tired buggy. There were only a few rubber-tired buggies around Bremen at that time. The best working horse we had was Scott. Father bought him when he was a little colt. When grown, he stood about fifteen hands high and weighed about one thousand (1,000) pounds. He was a roan with a large white streak in his forehead. Scott was one of the horses that did work. When hitched with a large horse he would work the large horse almost to death, or if you hitched him on a three-horse team, he would be the lead horse. If you hitched him up to the buggy and drove to town, he was not too active going, but coming home, he would zip, zip the turns and corners making the wheels squeak. The last day he worked he was in a three-horse team. We knew when we put him in the barn that night he was practically through. So that night we gave him a double stall so he could roam around. When we came out in the morning, Scott was dead. We dug a trench on the high land north of the house and we laid him away gently. There wasn’t much said around our house for a few days. Everyone would just do his work very quietly because we missed the “horse of all horses.” Be had horse sense. He would love to have his face rubbed and he, in turn, would put his head to your face and love you. Our horse, Fannie, worked with Scott and Jim. Fannie was purchased by my father when she was a small colt. She grew up to be a little larger than Scott and was a beautiful gray Morgan-size, or average American type horse. Fannie and Scott made the best general work team we ever had on the farm. You could depend on them when an urgent job was to be done. Fannie’s fate was different from that of Scott. In her late years, when she grew too old to do hard work, a neighbor wanted her to use as a utility horse for light work. He offered my father $35.00, which was a good price. Naturally, the family, including my father, felt bad about selling Fannie. As we watched the neighbor lead her down the road, the family felt that a good horse like Fannie should have been put out to pasture on the farm and then buried on the hill beside Scott when she finally passed away. Now I will tell you something about Jim. He was the slow type. Father bought him as a young colt at the Heckaman Neighborhood Sale, paying $10.00 for him. I can still see my father leading him home. He was bay-colored and was a Belgian horse, and when he grew up he was slow in his work. If you stopped him to rest and went swimming, on your return he would be at the same spot that you had left him without moving a foot. On the other hand, he was tricky. You would take him out to the water trough in the morning and he would watch you out of the corner of his eye and if you weren’t careful, he would turn and jump and kick with both his hind legs. I have a scar on my leg where he kicked me. Mother fixed the spot that was kicked with turpentine. With this solution it got well in no time. A year or so before, my brother, Vern, took Jim out to the water trough and-when he turned around Jim kicked him in the head. Father and Mother started to drive to the doctor’s and when they got as far as Uncle Fred’s (about one-half the way to the doctor’s) my brother lost consciousness and they took him in and laid him on the couch until he revived. I recall the last day that Jim lived. He got out of the barn somehow and got his head in the corn crib and at too much and foundered. We took him up to the thrashing floor and I stayed with him until the wee hours of the morning, when he passed away. Bill was a tall, long legged yellow horse. He teamed up with Flora to make a fast walking team. Tanglefoot was about the same as Bill and Flora in speed. She also made a good buggy horse. When she passed away, Father sent her hide to a tannery and ordered a winter overcoat made for me. She got her name from the fact that she had a peculiar gait similar to a pacer. Benny was a small horse midway between a pony and ordinary-sized horse. He was Father’s buggy horse and also the horse sister Dolly drove during her four years of high school. Among other horses I remember were two wild mustangs which took about a year to break to harness and farm work. We also had a team of mules at one time, but preferred horses which were more alert and less tricky. In his youth, my father farmed with a pair of oxen. Part of their harness was a wooden yoke which Vern’s son, George, now has. Thrashing time was a great event. We would go from neighbor to neighbor helping each one and knowing that there would always be a big meal prepared by the neighbor’s wife, complete with roast beef, chicken and noodles, home-made bread, rolls, home-grown vegetables, pie, cake, potatoes, jellies, pickles and everything else. 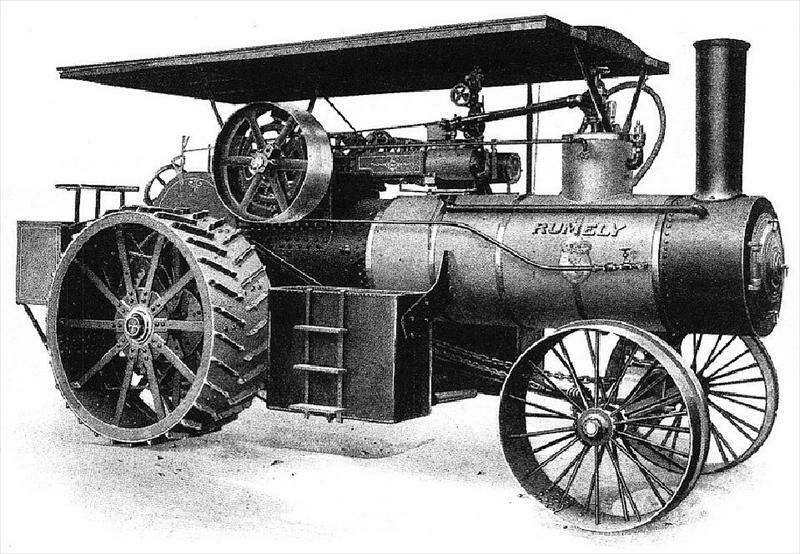 I used to like to watch the engineer on the Rumley Steam Engine. There were two tanks of water on the rear of the engine on either side of the firebox near the boiler. On each tank there was a pad so that the engineer could rest. I used to like to sit on one of these pads, the engineer on the other, and as the engine puffed and purred, the young men would like to clog the thrashing machine with wheat bundles and make the engineer look silly. Once in a while the engineer would give me a piece of twang (leather) so that I could make a fob for my watch. Butchering time was a big event at our house. It had to be done in cold weather, usually in November, because of lack of refrigeration in those days. This task took three men and their wives because it was an all-day job as we usually killed six fat hogs. Three large iron kettles filled with water were placed side by side, in. the barnyard and a fire built under them. It was my job to pump water and keep these kettles filled. Also to keep the fires going and the water boiling. I did not fancy this job because it took me away from the men and their interesting conversations about local and national news, such as politics, and so forth. Our mudboat was turned upside-down over trestles to make a platform about two feet high and four feet wide by ten feet long. A 30-gallon barrel was placed near one end and tipped toward the platform so that the edge of the open top of the barrel rested against the platform. The barrel was then filled with boiling water. After each hog was killed by shooting or cutting the jugular artery, it was put on the platform and scalded by drenching it in the barrel of boiling water. Iron hooks were put through the tendons at the ankles so the men were able to thoroughly drench the hog, pulling it up and down in the boiling water, and turning it end for end. 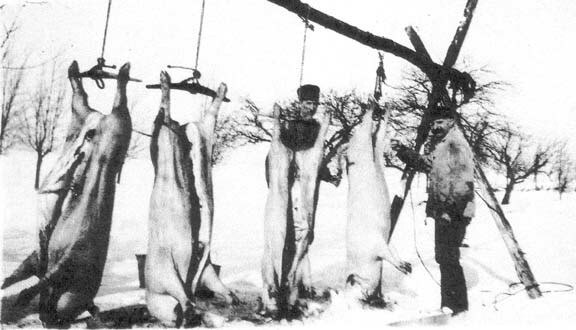 An 18-inch oak gambrel was then put through the tendons of each hind leg and the hog was hung by the gambrel up in a tripod made of three 12-foot logs. The hog was then cleaned by scraping with sharp butcher knives to remove hair, dirt, and so forth. It was further cleaned by pouring pails of scalding water over it. Next the head and entrails were removed. The head was cooked and made into delicious head cheese. The intestines and stomach were thoroughly scraped and cleaned and used as casings for sausage. The hog was then quartered so it could be handled more easily. Fat was rendered into lard. Children enjoyed the cracklings that remained from this process. Hams were cured in brine and smoked. Most of the remainder was ground and made into sausage. As we did not have a basement in the old house, we followed a custom of that time by building a cave in the orchard for the storage of our fruits and vegetables for use throughout the winter. First, a trench about eight by twelve feet and three feet deep was dug. Over this was built a domed frame strong enough to hold about two feet of earth which was then covered with sod to hold in the moisture and keep out the cold. 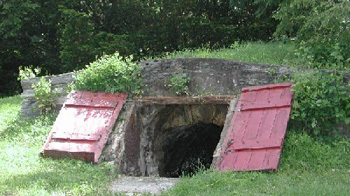 To enter this cave a slanting trap cellar door was installed at one end. Of course, one could not stand upright in this cave, but it was deep enough for the purpose. This cave was filled with baskets of apples, potatoes, cabbage, carrots, turnips, pumpkins, squash, canned fruit, crocks of lard, and so forth. You never tasted better apples than came from this cave. During my youth many unemployed men, usually known as tramps, would travel by foot from community to community doing as little work as possible and begging for food along the way. The wayfarers would come along the road and observe the notch made by other tramps on the hitching posts. These notches would signify whether it was a friendly home. I never saw a tramp turned away. Some would stop for a drink of cool water from the well. Others would ask for something to eat and they were never denied. Mother would make a large sandwich of home-made bread, creamy home-churned butter, lettuce or cabbage leaves from the garden, and any cold meat she happened to have on hand, such as beef, pork, or chicken. This was a meal fit for a king and the tramp would walk down the road and sit under an elm tree and eat his sandwich. Other weary travelers would frequently stop and ask if they could sleep in the haymow. They were told they were welcome to sleep in the house. Communication did not exist except by word of mouth. There were telegrams received at the Baltimore & Ohio Railroad Station, but it would take several days to get telegrams to the people. 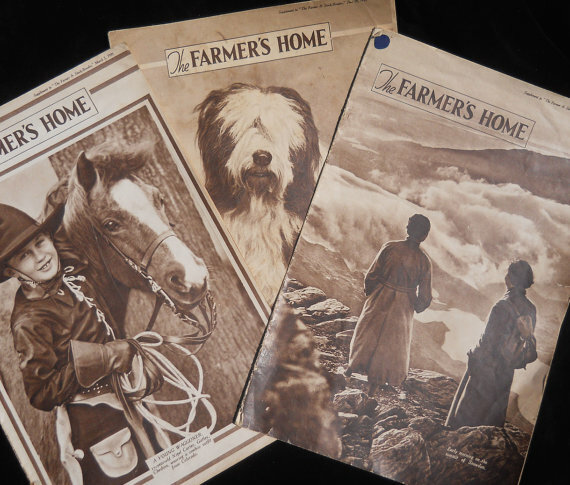 Our mail was composed of the Drovers Journal every Saturday, which my father read or mother read to him, and the Farmers Home Magazine that came every two weeks. The other mail was the local newspaper called the Bremen Enquirer, which was delivered every Friday morning. To get our mail, we rented a post box at the post office where anybody going to town would look to see if there was any mail in the box. When I was in the eighth grade, the rural free mail delivery was instituted. However, on some days the carrier could not make his route because of the condition of the highways. We did not have cement highways in those days. The highways were made from field dirt. Sometimes ten-foot lengths of logs were laid crosswise and these were called corduroy roads, or logs might be laid only in soft spots or sinkholes in the road. Then a little later on some highways were graveled by farmers who took their teams of horses and wagons and hauled gravel from nearby gravel pits. The gravel was hauled to the roads and dumped. There was also a clay pit in the neighborhood where a man set up a small building with molds to make the tile the farmers could use to drain their lands. Kerosene lamps were used in the house and Father would use a kerosene lantern in the barn. Usually we had one large kerosene lamp on the kitchen table so we could sit around the table and do our homework and look at the Sears & Roebuck and Montgomery Ward catalogs for guns. When I was a freshman in high school my parents installed acetylene gas lamps. Then later, electric lights were secured but this was after I left home after graduating from high school. There was no running water in the house. No bathroom facilities or toilets. If we wanted to wash our hands or get a drink of water, we would go out to the wooden pump. It seems that on cold mornings, the water was so cold, it would almost freeze my face as I was washing it. Our baths were taken on Saturday night in the kitchen, using Mother’s galvanized iron tubs. The toilet was beyond the orchard fence. I thought you would be interested in knowing how we got out drinking water. Close to the kitchen door we had what was called a dug well. We used water from this well until I was about ten years old. The well was dug by two brothers, Samuel and Jacob Knoblock [Samuel Knobloch (1851-1924) and Frederick Jacob Knobloch (1853-1936)]. They were big, strapping, 225-pound, 6-foot men, and they were what was called the well-diggers in the community. The well was about 18 feet deep and about 6 feet in diameter. Knoblock brothers lined the well with stones Father picked up from the field. These stones were stones that had come down millions of years ago, perhaps from Alaska, with the last glacier. The well was cleaned out twice a year and when we cleaned it out we would find small animals such as frogs, fishing worms, and so forth. Following the era of “dug” wells, “driven” wells were made by driving inch pipes unto the ground about 60 feet. 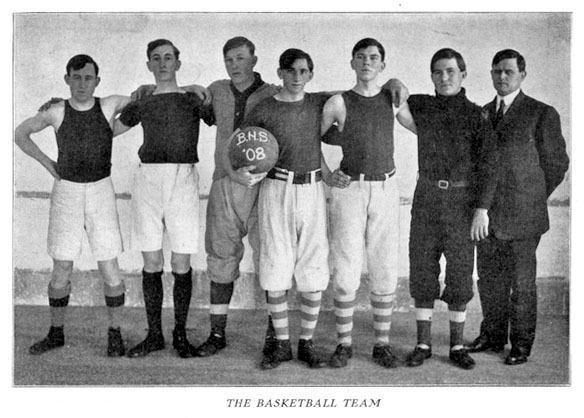 The year I was in 8th grade, six of us boys were walking to the Fair Grounds when a Bremen lady doctor by the name of Dr. Smith [Dr. Flora Smith (1872-1925)], who had a great big Packard, picked us up and took us to the fair grounds. That was in 1903. About that time a lot of different manufacturers started to make what is called “custom-made automobiles”. For instance, in Indiana, the Cole was made in Indianapolis. The Jackrabbit was made in Kokomo, the Auburn at Auburn, Indiana, and several others. Henry Ford was the first to grasp the idea of an assembly line and was the one who started America—forward with the Ford automobile. The people demanded better roads just because of the need created by Henry Ford. He was a great Champion of labor. One day he announced he was going to pay $5.00 a day per employees. That almost shook the world. All the people said he would never last and that he would go out of business, but he didn’t. My parents and the three older children went to the Chicago World’s Fair in 1893. Of course, there were always chores to do, so my father went alone. Mother and the three children went later. I thought I was old enough at five to go along, but my parents thought otherwise. 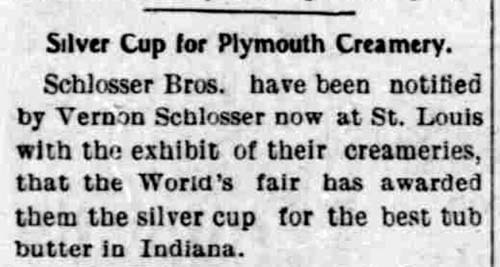 In 1903 [1904, actually] Vern went to the St. Louis World’s Fair to see the butter exhibit which had won National First Prize for creamery butter for Schlosser Brothers. This is the butter which Vern helped to make at Bremen. When Vern returned home and told Monroe and me about the wonderful fair, we decided to go. Our parents got together $36.00 which paid our expenses for two days and our excursion rate train fares. Besides viewing the butter exhibit, we found many other exhibits interesting. At this time my father was interested in a fanning mill (used for cleaning oats and wheat for seed), so he instructed Monroe and me to study the different types of mills and buy one of the type we thought best. We spent several hours making this selection and Father was satisfied with our choice. On this trip I got weighed on the first standing scale I had ever seen. It cost a nickel to get weighed and my registered weight was 105 pounds. The Grange is a national farm organization. During my youth it served two functions—it offered the main social life for many farm families, including ours, and it spoke for agriculture from a state and national viewpoint. It fought for good roads, rural free mail delivery, rural telephone service, better agricultural methods, improved home economics, and education. 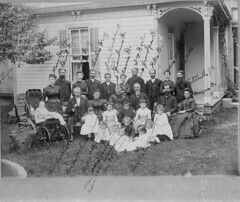 My parents, with a group of neighbors, organized the local Bremen Grange in the early 1900s. The elected officers were the Master (or President) Vice Master, Overseer, Secretary, Treasurer, and chaplain, along with an officer called the Lecturer who had charge of the bi-monthly programs. I was elected to the office of Lecturer for a period of two years while I was in high school. This organization appealed to the entire family. At first, meetings were held in a rented hail, but in later years they were held in the various homes. A special highlight of the year was the November meeting when a pot-luck Thanksgiving feast was enjoyed by all. Each woman brought her favorite and best dish. Many of these Thanksgiving dinners that I last attended were held at sister Eva’s. If we want to save America, we should put in the minds of young people today that they have a certain responsibility in life. That is what young people were taught when I was a boy. 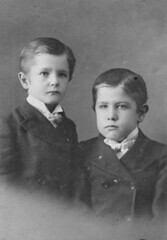 My father and his brother, Gustave, went on a trip to Utah that took six weeks. 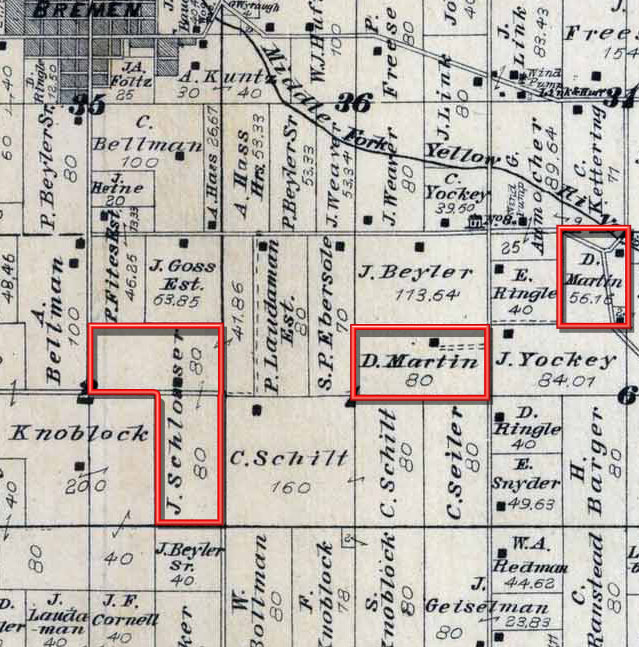 Before he left, father said to me, “You move the house up from the ‘Sixty’ (the land by the river that my grandmother lived on as a girl) to the new place on the Yockey Farm.” He also said “You go to John Dietrich [John R Dietrich (1848-1917)] (the local merchant and banker) and get $1,800.00; go to Chicago and buy a carload of feeders.” In those days your word was as good as your bond. I went to Mr. Dietrich one morning and told him what my father told me to do. He wrote me out a check for $1,800.00. I took the B&O train to Chicago and in South Chicago I met my brother, Vern, who was then working in a wholesale produce house and he went with me to the stockyards. We purchased a car of thirty Texas feeders, or young cattle, and shipped them to Bremen. I got home that evening and the next morning went to the railroad station with four helpers, unloaded the feeders from the stock car, and drove them through the town of Bremen to our farm which was about three miles out. That is what I call responsibility. It was a challenge and I accepted it. Vern and Monroe finished the eighth grade the same year and ay father was influenced by a neighbor not to send them to high school because he was not sending his son. The two men decided it would be better for all three boys to go to work. The summer my brother Vern was 17, he took a job as the butter maker’s assistant at Schlosser Brothers Creamery and Monroe drove a cream transfer wagon for the creamery from Klondike (near Elkhart) to Bremen. Vern’s account of his short course at Purdue gave my mother, who had always been interested in education, the incentive to see that her family would get as much education as possible. After Monroe’s one year absence from school, Mother decided he should go to high school. After his graduation from high school he became the bookkeeper for Schlosser Brothers Creamery. In a year or so he decided he needed more education in bookkeeping and enrolled at Valparaiso College for a three-month course. On his return to the creamery, he set up the books with the double-entry system, discarding the single-entry system. About this time, Purdue University started holding two-day Farmer’s Institutes in various parts of the state, covering subjects of interest to farmers and their wives. Mother was especially interested in the Home Economics Department so she decided that my sister, Eva, should take a six-week short course in that subject at Purdue University. Although I was not strong as an infant, I grew up and had my first operation when I was 75 years old, which was for a cataract of the right eye. Then, too, I had a sort of heart problem when I was about 45 years of age. My pulse was going over 100 and It should have been 72—but somehow and some way I overcame this. My early introduction into medicine was when I was a boy and suffered many cuts and stubbed toes, injured shins, and boils. These were all taken care of by solutions of turpentine and water. For boils, Mother would usually boil a cup of flax seed and put it in a small bag. While still hot this was put on the boil, well wrapped, and left on overnight. We did not get any shots or vaccinations because there were none at that time. They came later. Some older people would wear a piece of asafetida on their neck like a necklace. People wore it because they felt its garlic-like odor was so great that a germ or virus was afraid to get near the body. The next introduction to medicine was when we boys were running the old fanning mill, which was a machine that cleaned the wheat before we sowed it. We were running straw through two cogs which would wrinkle the straw up and for some cause my finger caught in the cogs and it crushed my first finger on the right hand. My mother and father immediately took me to Bremen to a Dr. Yunkman [Dr. Anthony B Younkman (1835-1899)]. He had a little two-room office at the corner of his residence. Dr. Yunkman looked at the finger and he told my father to hold my hand. Dad held any hand and Dr. Yunkman took a pair of pliers and pulled the nail off. That made me see stars: This was before the days of anesthetics. Dr. Yunkman then wrapped the finger up and I left with my parents. In time, it was healed. The next time I got hurt was when I was taking a bundle of barbed wire to the old ‘Sixty”. I was driving Fannie hitched to a buggy. Going out of the gate of the lane, for some cause we hit the post of the gate. My hand flew over on the bundle of barbed wire and the palm of my hand was slashed between my index and second finger. This really did hurt, but I went in the house and Mother poured a solution of turpentine on the cut and wrapped it up. In time, this also healed. One Thanksgiving Day when I was about 12 years old, we three boys went hunting in the woods owned by our school teacher, John Marburger [John L Marburger (1866-1920)], which was across the road from Father’s farm. As we were climbing over a rail fence, one rail broke, I fell to the ground and broke my left arm. My brothers took me home and when we got home Father asked my brother, Vern, to hitch up Fannie and go to town to get the doctor. He went past Uncle Fred’s house and told them I broke my arm so they immediately came to our house. The doctor was notified and in due time I saw the dapper gray horse and buggy coming down the road lickety-split and turn into the lane. This was Dr. Nussbaum [Dr. Charles E Nusbaum (1868-1919)]. He came in, put his medical bag on the chair, and looked at my arm. He said it was broken and he would set it. He told Uncle Fred to hold my elbow. The doctor pulled and pulled and it was not long before he had the arm set. Again, I saw stars!! He put a thin slice of board on each side of the arm and wrapped it up with a bandage. He told me it would be all right in three weeks. In three weeks we took off the splint and the arm was a little out of shape, but okay. Among the many things Vern told us about Purdue and his train trip home the fact that there was a man on the train whose face was red as fire. We thought no more of this until a week later when Vern came down with the measles. Then in due time the rest of the family came down with the measles except Father and Mother, for they had had this disease when they were young. We stayed in bed for about four days and our main food was sassafras tea and toast. Medication was probably limited to quinine. This was the only time I ever had hallucinations, very likely my temperature was quite high. I thought I saw a Roman chariot and castles and dragons flying over the earth, plus many other things, but I overcame the measles. This combination of disease and boyhood accidents was my first inkling of an introduction to medicine. There were many factors, of course. Part of it was due to a young doctor named Dr. Nussbaum, who had come to Bremen from the Rush Medical College in Chicago. 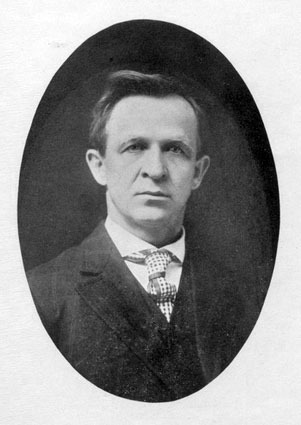 [Nusbaum graduated Northwestern University in 1893.] He was an energetic young man and soon gained the confidence of the townspeople and the farmers. He became very popular and he drove some beautiful horses as he went on his medical calls. After seeing him, it seemed to make me want to be a doctor. Also, sister Eva came from the doctor’s office one day and told Mother she wished Walter would become a doctor like Dr. Nussbaum, and that little bit of conversation seemed to stick to my heart. I knew the things I would miss by leaving the farm, such as cold January weather, snow, hunting, and the maple syrup time in February. In March and April we would sow oats and plow the fields for corn planting about May 10th. In June we would cut the wheat and oats. I’d also miss the thrashing times which were a wonderful thing for any young man when we would go from farmer to farmer and help them thrash their wheat and oats. I would miss filling the silos and husking the corn in the fall, making apple butter and doing other farm work that was to be done. Looking back on it now, I feel there would have been lots of compensation in farming, money and other things, growing crops and live animals. However, I decided to become a doctor. Bloomington, Indiana, where I decided to study medicine, was 175 miles from home. To get there, we would leave Bremen in the morning on the B&O train for Milford Junction. From Milford Junction we would take the Big Four Railroad train to Indianapolis and after a two-hour layover in Indianapolis we would take the Indiana Southern to Bloomington, Indiana. In those days, we did not have suitcases as the students do now. I bought a trunk and this was filled with my belongings. After I found a room at Bloomington, I got a drayman who drove a one-horse dray to pick up my trunk and deliver it to the house where I had rented a room. Those years at Bloomington were almost as primitive as the farm. Our drinking water was collected as rain water from the rain that drained from the house tops into a man-made cistern. They did not have any sewage system and each home had its toilet back by the alley. In the early years of this century, medicine was almost non-existent in Indiana except for quinine, strychnine and morphine, and abdominal surgery. Dr. Fleenor, financed by the Rockefeller Foundation, made a survey of all medical schools in the United States. Since that report the medical schools changed for the better. They ceased to be places where an ex-school teacher could take a year of schooling and read medicine with the local doctor and then become a doctor. But after this survey, there were five schools in Indiana that combined and made one school called the Indiana University School of Medicine. 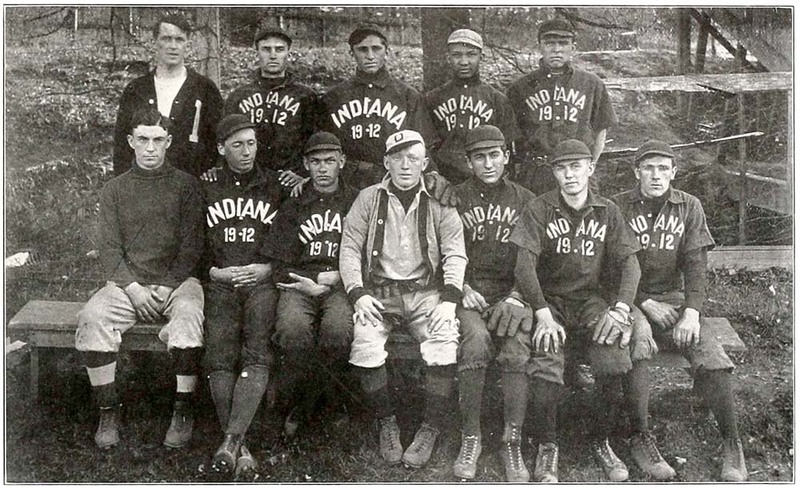 A four-year course was established with the first two years at Bloomington and the last two years at Indianapolis. 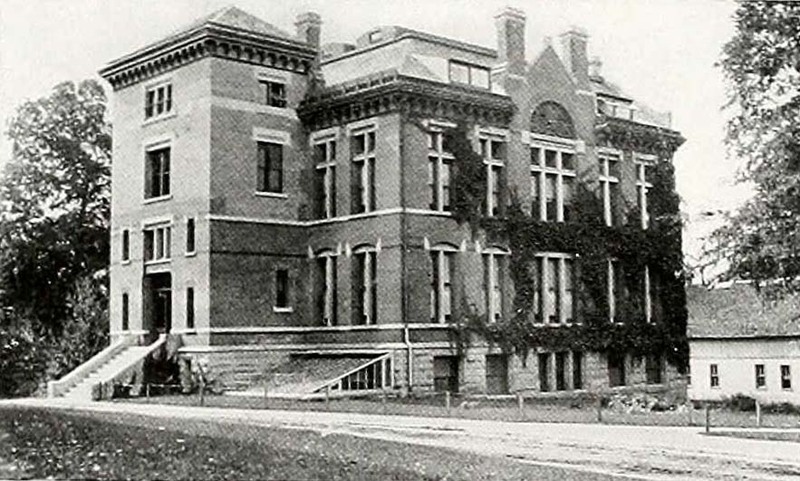 I entered college at Bloomington in the fall of 1908. I remember the last day I spent on the farm before I went to college. It was Labor Day of 1908. To help pay for my first year of college, I farmed 60 acres of land which I rented from my father. He got two-thirds of the money for his share, and I got one-third which was $325.00. On this particular Labor Day I finished sowing wheat at about 10:00 in the morning, then I went home and took a bath in a tub under an apple tree, as we didn’t have a bathtub in our house at that time. I then hitched Flora to the buggy and drove to Plymouth where our Bremen team played baseball against the Plymouth Clippers. The next morning I took the B&O train to college. Mother fixed up a shoe box of fried chicken for me, which I ate at the first stop, Milford Junction. I got quite homesick while I was eating my chicken. I suspect that if someone had said to me, “Let’s go home”, I would have taken them up on it. The cost of my four-year college education, except for the above-mentioned $325.00, was $2,234.50. I gave my parents a note for this amount, which I later paid. The first vote I ever cast was in May of 1909. I was at Bloomington, Indiana, going to school when the local option voted to outlaw alcohol. Being old enough to vote, I cast my vote against alcohol. We never had liquor of any kind in our home. I remember that at one gathering of relatives and friends, someone suggested furnishing a keg of beer, but Mother said, “No!” She was a member of the WCTU. 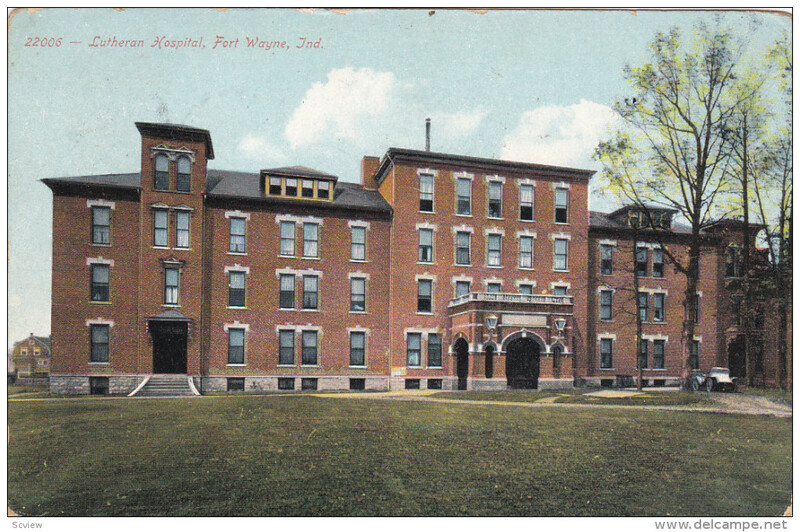 The hardest year of my life, as far as work was concerned, was when was an intern in the Lutheran Hospital at Fort Wayne, Indiana. The surgeon, Dr. Herman Dumeling [probably Dr. Herman A Duemling (1845-1913)], was a hard worker, but I made up my mind he could not outwork me. I assisted him in 966 operations that year, besides doing intern work for other doctors of the staff. My room was on the second floor of the hospital near the elevator and across from the emergency room. I was given the emergency room to take care of as well as other duties as an intern. I would go to bed about midnight and usually get up two or three times a night to take care of the patients. Then I would be at my post when Dr. Dumeling came in the morning at 7:30 o’clock. To my surprise, he asked me one day if I wanted to stay with him, but I had planned to have an office in St. Joe, Indiana, and I told him I had better go there. This was the one big mistake that I made. After six years, Dr. Dumeling died. If I had stayed with him, I might have had a good surgical practice. But as I look back on it, I’m still satisfied with what I did in the years up to now. I was paid no salary as an intern, but the hospital furnished my room and board, five white suits, and my laundry. However, I assisted and gave anesthesia for several surgeons who made me gifts amounting to $800.00. 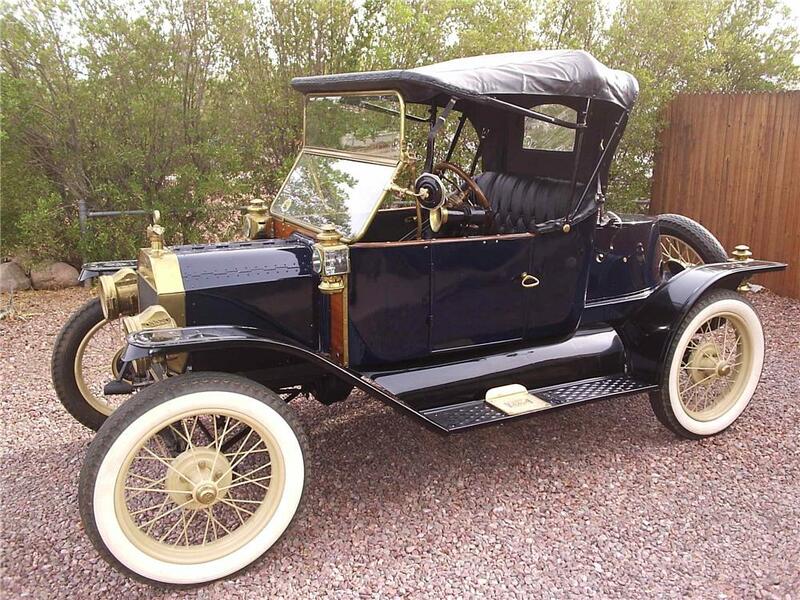 Out of this $800.00 I paid Henry Heckaman [probably Philip Henry Heckaman (1869-1948)], the Bremen Ford dealer, $450.00 for a new 1913 Ford Runabout, and a retiring doctor of St. Joe, Indiana, $100.00 for a year’s rent of his office, fixtures and drugs. This left me $250.00 to start my career. On September 17, 1913, I was married to Zula B. Laudeman [(1892-1918)], who died in October of 1918 during the big Flu Epidemic of that year. To us were born Daniel Briggs and Joseph Lincoln. June 19, 1920, Marion May Pike [(1895-1983)] and I were married. We just celebrated our Golden Wedding Anniversary. To us were born two daughters, Bonnie LaVere [Michaud] and Verna Martin [Neidigh]. Father was a public-spirited man in the community. Of course, his farm and his family were his main interests, but for a number of years he served as road supervisor of his 3-or-4 square mile district and was elected to a 4-year term as trustee of German Township, besides being elected to a 3-year term as a commissioner of Marshall County, Indiana. You will find his name listed with the other commissioners on a plaque on the East Garro Street Bridge in Plymouth, Indiana. After over 50 years of marriage, Father became ill and it was necessary to have a sale of his livestock, farm equipment, grain and so forth. [Note: This would have been 1935.] The auctioneer was Harold Steiner [(1892-1961)] of Plymouth, Indiana, whose father before him had conducted my Grandfather Martin’s sale in 1900. I remember two touching events of this day of The Sale. 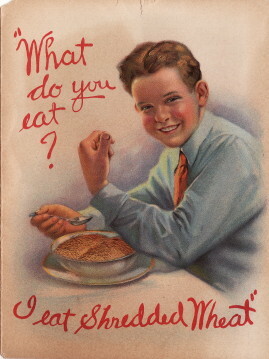 One was when went into the house and found Mother feeding soup to my ailing Father with a spoon. They seemed to be comforting each other because they could not bear to be outside where The Sale was going on. 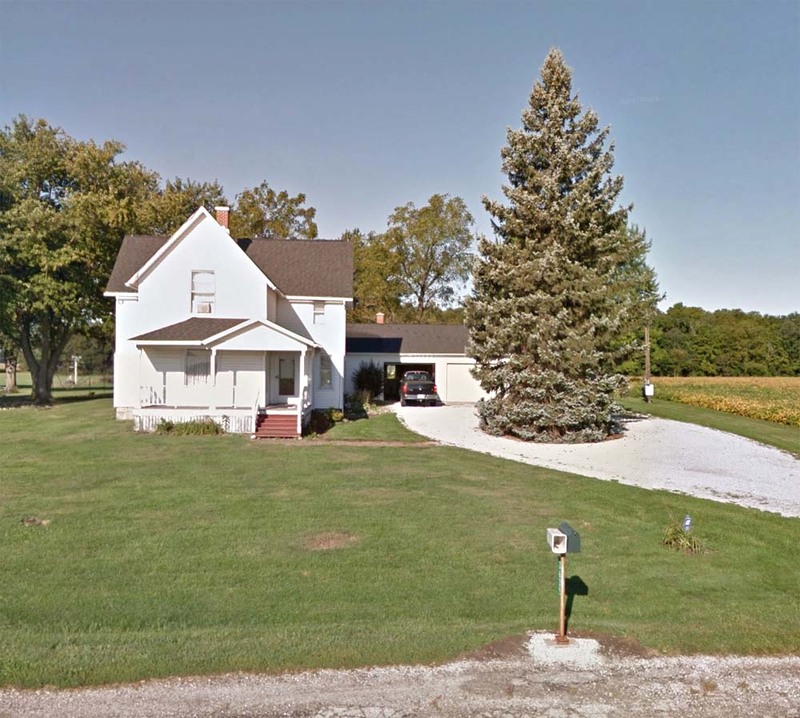 The other touching moment was hearing Mr. Steiner tell the friends and neighbors who had gathered for The Sale of how “Uncle George” and “Aunt Emma” had lived and toiled on this farm for over 50 years, and now that era was at an end. 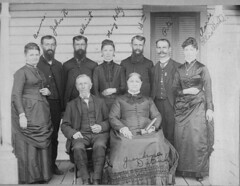 After Father and Mother passed away, the estate was divided among the children, and brother Vern was the administrator. He had retired from business that year, so it gave him an opportunity to spend his remaining days on the old farm. So the 80 acres with the buildings was sold to brother Vern, and after he moved to the farm and was there a few years, he died with a heart attack. [Note: This would have been 1945.] 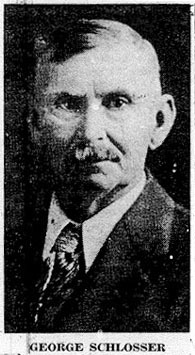 His wife then sold the farm to an old neighbor, Welcome Huff [(1891-1990)], son of James Huff, who had lived in the vicinity about the same length of time our parents had. The farm was then out of the family’s hands until five years ago when our daughter, Verna, and her husband, with their four children, bought the farm as a place to live. Verna’s husband, Robert, had employment as a mechanical engineer 16 miles away at Mishawaka, Indiana. Verna and her husband named the homestead “The Heritage Trail Farm”, and last Christmas [this would have been 1970] Grandmother and I decided to go visit them and spend the holiday vacation with them. We took a Pennsylvania Railroad Train at 7:30 A.M. and arrived at Plymouth, Indiana, at 2:30 P.M. There was a great deal of snow there and the train was over an hour late. Robert and the younger grandson, John, met us at the station and from there we drove 15 miles to the Heritage Trail Farm. The conversation, of course, was about the countryside, the old homes we would see on the right and left, and the new improved roads, the crops, the cattle, and the trees. In other words, we were busy talking about things that transpired in the last eighty years. As we approached the old homestead, we observed many changes. The rail fences that were made from rails that Father had split from trees he had felled in the woods had been replaced with wire fences. The combination corn crib and buggy shed was remodeled to make a garage and a place for tools to keep them out of the rain and sun. The outside of the barn was the same, but we found out later that in the inside of the first floor there was a great change. Electric lights were used instead of the old lantern that we carried by hand. The cow stalls and horse stalls were gone and in their place were many hogs, little pigs, piglets, feeder hogs, and mother hogs—over 150 of them. The feeding of livestock is now automatic. Before, we had to carry water and feed. We drove into the lane and stopped outside the kitchen porch and then we saw the light in the kitchen. The light was not an oil lamp like my mother had used, but it was an electric light that brightened the whole room—the room which had always been the heart of our home. Each generation is a study in character. Even the 3- to 5-year-olds have mostly trust in the older generation. They look up to you with hope. After the under-school age, you have the generation to teen-age. They also are wonderful. They are what I call the Questioning Age Generation. In other words, they are always asking questions and their questions should be answered. And then following that generation we have the young men and women in the teenage of life. It is a beautiful age for them, yet they have lots of problems, and the parents, teachers, doctors, ministers, and religious leaders should try to counsel with them. Then the next generation, I lump together age 25 to 65 years. They are the ones that work hard to try to keep all other age groups together to help them get along in life. Then after that age you have the senior citizens who have enjoyed the sorrows and the blessings of life and they also need care and help. I selected James Williams out of these groups as the one who was interested in people of all ages. James worked as a doorman for a rich, fashionable apartment house. He was a tall, six-foot two-inch, 200-pound man, erect and proud. He always spoke to the children, the teenagers and young folks and he would give them advice and they would counsel with him. He would always tell them to get in early when he would see them leaving for the evening. To the other generations, he was a friend among friends. One day he came to my office with a cough. After a consultation we decided to get his chest X-rayed. I drove him to the X-ray laboratory where his chest was X-rayed. The roentgenologist told me that he had a tumor is his lungs. From there, I took James home. On the way home he said, “Now, Doctor, I am not afraid to die because I’m a free man. I’ve had everything in life and I’m spared.” It wasn’t long until James no longer could do his work at the apartment house and he settled in his little two-room apartment on the second floor to live the rest of his days. His second-floor apartment was lighted by a bulb hanging from the ceiling and was heated by a fireplace that burned soft coal. Of course, this soft coal would make the walls smoky and black. The last few weeks of his life I would go up to see him every evening after my office was closed, and we would sit there at the fireplace with hickory sticks in our hands to stir the fire up and talk about freedom. No one knows what the future will bring, but America will continue to progress. New things will be invented. Food—especially protein—will be made from oil, coal, algae, and vegetables such as alfalfa. I have seen big changes in agriculture. Verna and Bob’s farm now produces 50 bushels of wheat per acre where it formerly produced 20, and the same thing happened with the corn. I can visualize that our farms in America will probably double in production in your lives [Indiana averaged 76 bushels of wheat per acre in 2014]. If the future explodes as much as it did during my lifetime, you will be living in a wonderfully complex world. For instance, when I was a real small boy, some men came to our house to tell us my grandmother [Eva Margret [Karrer] Schlosser (1829-1892)] was very ill and that the doctors would be out that afternoon to “bleed” her. When our family got to her house two doctors, dressed in black suits, came out of her bedroom with a bloody sheet and blood on their hands and said they had just bled Grandmother. Today, instead of bleeding people, as a rule we give them blood transfusions. Needless to say, Grandmother lived only a few hours after the bleeding. We have come a long way to this day of organ transplants. Something else that is on the horizon is extrasensory perception. Further work will be done on this by psychiatrists. In Ruth Montgomery’s recent book she talks about Jean Dixon and her foretelling four years before John Kennedy’s assassination that he would be shot. Eight years before Nehru’s death, Jean Dixon foresaw what was going to happen. She predicted that China, years before it happened, would turn to Communism. Almost any physician who has practiced a number of years can tell you about some extrasensory perception that he witnessed. This field, together with psychiatry, will be a large field. 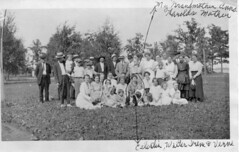 Walter K. Schlosser, M. D.
Family Dietrich 003 Harold's parents, John Randolph & Anna seated far rt. middle row.